Just picked up a little travel pouch for a couple bucks and planned my vacation! One i have had already and the others are new to me sticks (thanks to all of you! lol) I think it looks like a decent line up for a weekend at the beach. I could get maybe 2 more in there but it would be a tight fit. Plus i might not even get through more than 2. I try not to smoke around my daughter as she has asthma. So it would be my evening activity. So thursday, friday and saturday night. Plus maybe one on the beach during the day. lol Havent quite decided yet. I only got the chance to smoke about 4 on my 9 day vacation. I was just too tired by the end of the day. Like others said, be sure to bring extras. You will be surprised how often you will want to give some out. I tend to not smoke as much when on vacation, I think your on the right track, bring a fiver. Same here. My vacations are family time and the evenings are more of that and exhaustion. I would be lucky to get more than 1 a day in on the beach! Enjoy the down time with the family it goes all too quickly. Ill probably pack a few more sticks. lets see if i can get some out to someone while im at the beach. Where on the coast are ya headed? Sounds great! I spent 23 years on the west side of the state and never made it down to the Oregon Coast. I hear it's wonderful. Someday I hope to check out all the sights. i would carry 15 personally. that way you have options. you never know what a situation may call for. Damn, check out the age on that Perdomo. 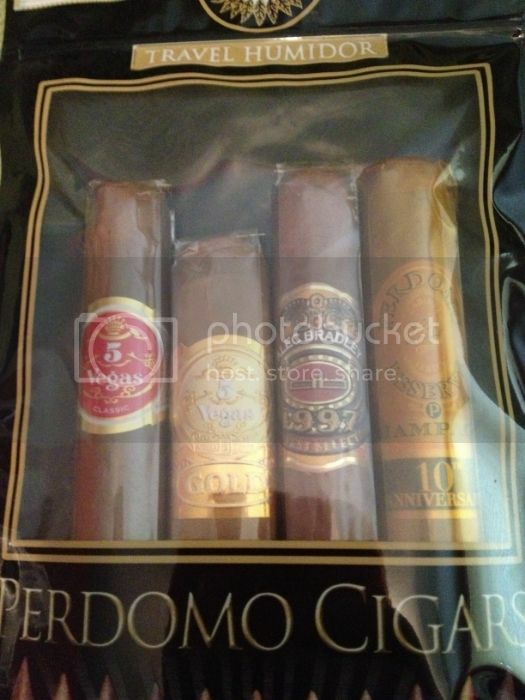 that cigar come with cellophane that is yellow from the get go. and when you go on vacation, dont forget your stogie stand. those things are great to throw in the pocket and you always have a cigar rest then. That's a great area, I've been through there a couple times coming home from the Hood to Coast relay but never stopped. I still love the south coast around Bandon, but I grew up going between there and up to Newport. But looks like a good selection of sticks, but I'd toss a few more in just for varieties sake. Thanks for the kind words Matt, and yeah ... I tease about the champagne. I always type that when I see it lol. It's true lol. He's said that at least 2 other times to me when I've posted Perdomo champagne pics. as for the stogie stand Kuzi... I just ordered another one so I have one for travel! You really should stay there some weekend. It's really nice for a quite small town beach trip. Couple good cafes and some fun dumb knickknack shops. I'm gonna put a few more sticks in before I leave... I just haven't decided which ones yet.